Hello there! 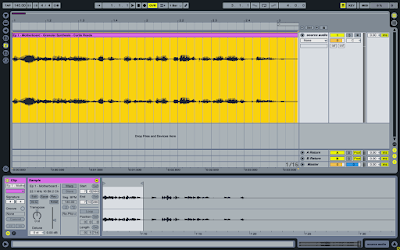 This tutorial, the first in a series, will show you how to build your own granular synthesis system using Ableton Live (but the principles can be extended to any software sequencer) by slicing and re-sampling audio clips. Granular synthesis is an incredibly flexible tool for the modern-day sound designer. Composed of numerous "micro-sonic" slices of sound known as ‘grains’, this cutting-edge synthesis method is a hugely powerful sonic-sculpting technique, capable of replicating a huge variety of sounds from stringed instruments to gushing mountain streams as well as crafting unique, otherworldly structures. Imagine the sound of dropping a single grain of rice onto a sheet of metal - a sharp and short 'tick'. Now imagine the resulting sound from pouring a huge bag of rice onto the same sheet - a softer, 'whooshing' sound. This is granular synthesis! - One sound composed of numerous tiny sounds (or grains) of very short duration (0 - 50 ms). 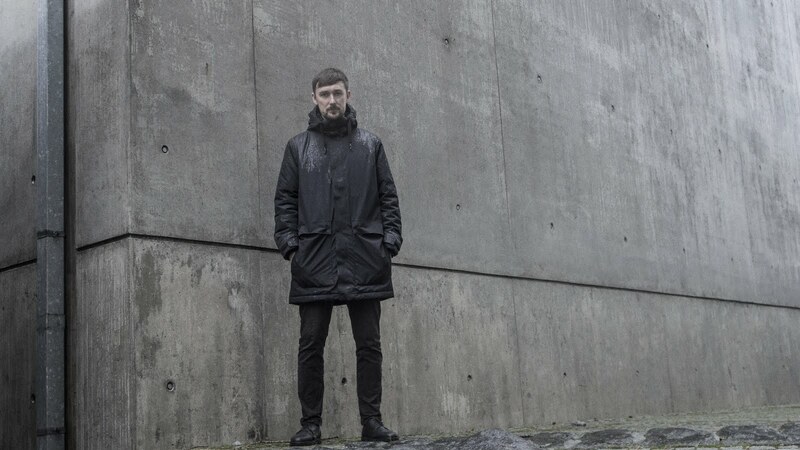 As I am sure you can imagine, the resulting sound collage depends very much on the tiny sounds it is composed of… These can be anything of varying length from a snippet of recorded audio to a pure sine waveform, from a static sound to one morphing over time. They can be raw, filtered, effected, panning, fading in and out - go mad with it. Going back to our rice metaphor… Imagine you are holding the bag from the opening so you can control the amount of rice spill out at once. This rate or density will dictate how sparse or full the sound is. What do I mean by that? Well, imagine spilling out the rice a couple of grains at a time and the succession of 'click', 'click', 'click' that you would hear. The more you open it, the closer together the 'clicks' become and the more 'whoosh-like' the overall sound gets. This translates to how high the rate or density of the grains is (with low rate being sparser). That is the core idea of granular synthesis. If you want to get stuck into the theory further, I would really recommend reading "A Computer Music Tutorial" or "Microsound" by Curtis Roads. For this tutorial, we will be breaking down a longer audio file into grains of sound and then reassembling them using multiple instances of Live's sampler/simpler with one mouse click. Step 1: prepare your audio! eg Unprocessed vox "This is the first..."
Next, warp the file to your tempo settings... Use repitch mode as the others implement their own type of granular synthesis. Once you have it prepared, consolidate the clip and copy it to a clip in the session view. Just for the sake of this tutorial, I used every 50ms segment as a grain but you can discard what you dont want or mix up several different audio files to build your synth. Now for the trick... Right click the clip and select "Slice to New Midi Track". In the following page choose "create one slice per warp marker". Now each of the grains you divided up using the warp markers will the sliced and re-assembled. 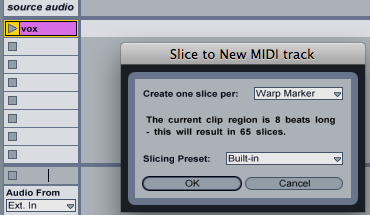 A new Midi track will appear with all the slices loaded up into Simplers grouped as a Drum Rack (handy!). If you launch this clip, it will still play the same as the original audio file, however, we can now mess with the playback with much more versatility. Try dragging out the syllables (grains!) 4 times as shown in the next picture (quadruple the tempo of the clip, then shorten the resulting notes and duplicate them 4 times side-by-side). Drop down the sustain to 0dB, shorten the attack, decay and release times... You should hear a sparse-sounding (clicky) result. For those of you who have Sampler unlocked, right click on Simpler and select "Simpler --> Sampler". The power is in the modulation page. Link LFOs to filter cut-off freq, pitch, volume, panning - whatever you like really. I usually knock off the "retrig" button and set the LFO freq to some low value so the sounds gradually progress over time but whatever you think sounds best! It may be seem a bit tedious to go in and adjust 40+ Simplers/Samplers (but trust me, you can get some really cool sounds) so pick your favorites and work with those. 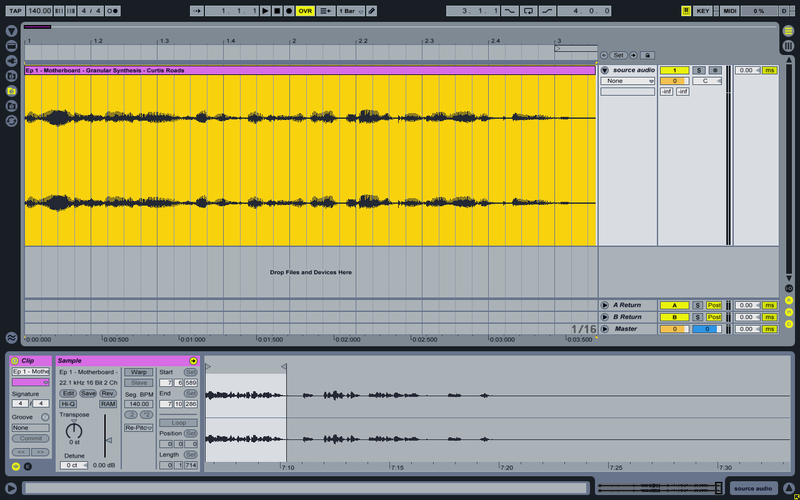 Then you can further process the grains, either individually, or together with Ableton or external effect plugins. Finally dont forget to save your instrument for future use! !